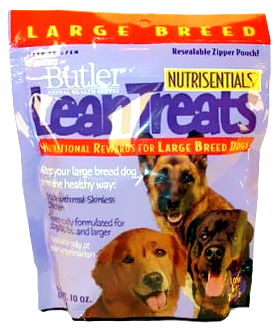 Help your dog sport a slimmer figure and better health with Butler NutriSentials Lean Treats for Dogs. These low-fat treats are made with real skinless chicken with a chewy texture your dog will beg for. Packed with protein and nutrients, you’ll feel good about rewarding your dog with Butler NutriSentials. Lean Treats are a healthy treat made of fresh skinless chicken, contain only 7 calories per treat, 0.5% of Sodium, and are very low in fat. Lean Treats also contains 7.5-8.0% fat on Dry Matter basis - many veterinarians recommend for diabetic dogs or dogs with pancreatitis. Great for use in baiting, rewarding, and treating a dog, and can also be used for training puppies. As a pet owner, you may struggle with deciding how to reward your pet without packing on the pounds. VetInternetCo.com recommends Lean Treats for your dogs and cats!